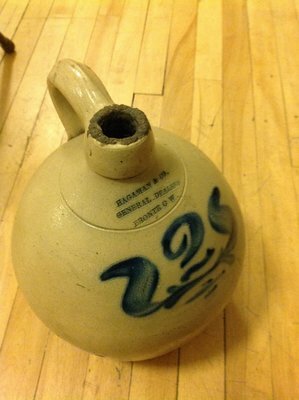 This "stoneware" storage jug was found in a shed at the former Patterson family farmhouse in the old village of Merton, R.R.1 Bronte, Halton County. The present day owner is a descendant of the Riggs and Patterson families who farmed for generations at Merton. According to the Town of Oakville research report by Laurie Smith Heritage House Consulting which is linked here for your further information, the Hagaman business was started sometime before 1842 by Benjamin Hagaman. The business bought and shipped grain as well as the importing of ready-made goods from family connections in Oswego, New York state for their stores, one in Oakville, the other in Bronte, and later in Ridgetown, Ontario. Pages 48-8 to 48-9 of the linked report have the detailed information about the two Hagaman cousins. Benjamin's cousin, Worthington Ely Hagaman, 1820-1892, took over the business including the Oakville dry goods store Benjamin had founded, Gage & Hagaman, later called Hagaman & Jull when his daughter married Bennett Jull who had come from Orangeville to clerk in the Oakville store (as per the Orange Lawrence family history document also linked here FYI) in 1872, from 1850 to 1892. Benjamin kept the Bronte store. W.E. Hagaman lived in the house that was built in about 1866 at what is now 1118 Lakeshore Road East, aka "the Hopgood Estate". The house has a heritage plaque on it, "1866 W.E. Hagaman Grain Dealer". The Hagaman's moved to Ridgetown, Ontario in later years although W.E. 's wife, maybe more family members, is buried in St. Jude's Cemetery, Oakville. The interior of the jug is glazed and clean. Around the mouth there is rough, hardened, greyish matter that perhaps originally sealed the cork and could not be cleaned off. "C.W." stands for "Canada West". Lawrence, Jull Families of Sheridan, Trafalgar Township, Halton County Laurie Smith Heritage House Consulting: Hopgood House, 1118 Lakeshore Rd. E.